Tacita Dean part of the Unilever Series at the Tate Modern. Tacita Dean at the Tate Modern. 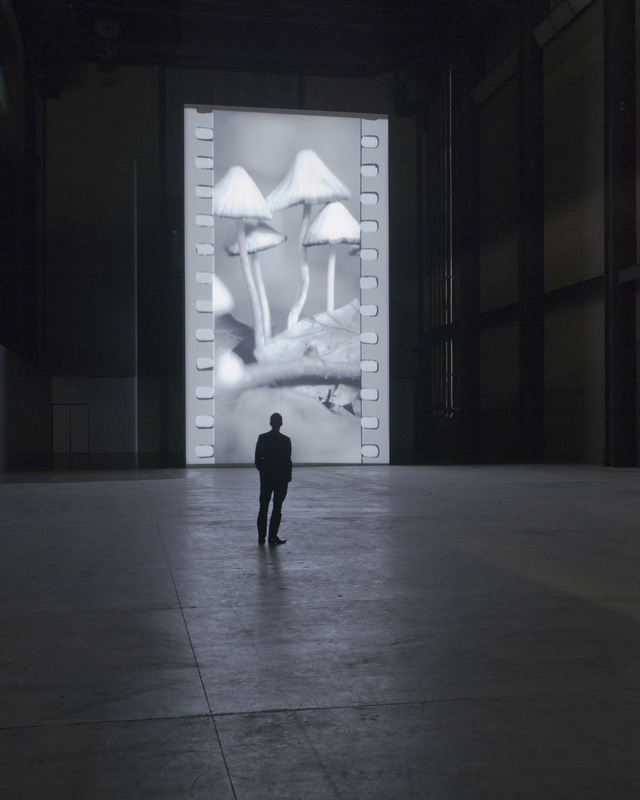 The Tacita Dean exhibition leaves you staring at the screen in the Turbine Hall of the Tate Modern. Part of the Unilever Series 2011, “FILM” by Tacita Dean, shows giant images screened at the bottom of the vast space of the Turbine Hall. “FILM” catches the attention of the public that gazes at the film produced by the famous visual artist. Tacita Dean has created an eleven-minute silent 35mm looped film projected onto a monolith standing 13 meters tall at the end of a darkened Turbine Hall. It is the first work in The Unilever Series dedicated to the moving image. “FILM” is a portrait of the analogue, photochemical, non-digital medium of film. 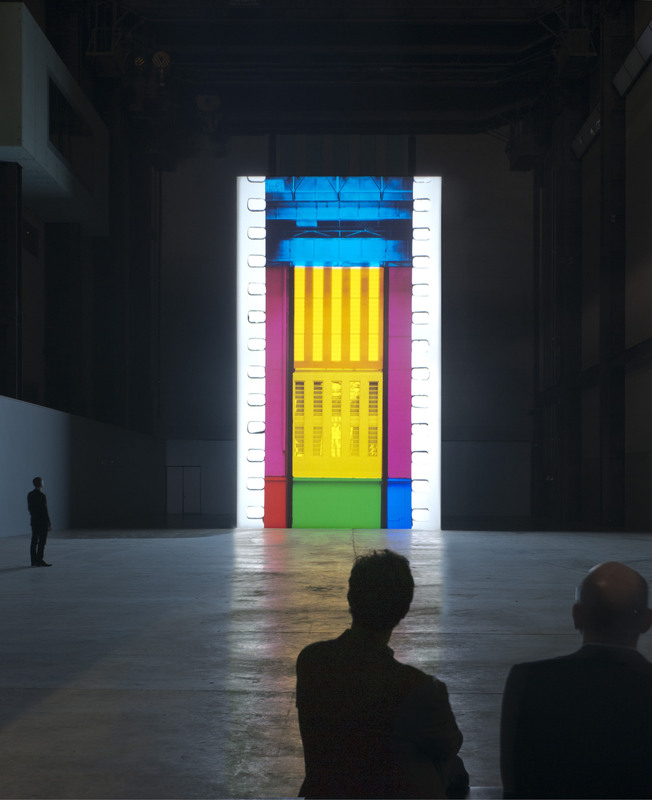 It was made by turning a Cinemascope lens 90º and upending the usual landscape format of the movie screen so it becomes vertical, scaling itself to the proportions of the Turbine Hall. Tacita Dean is a visual and conceptual artist who express herself with images and film. She is best known for her work in 16mm film, although she utilises a variety of media including drawing, photography and sound. Her films often employ long takes and steady camera angles to create a contemplative atmosphere. Her anamorphic films are shot by cinematographers John Adderley and Jamie Cairney. Her sound recordist is Steve Felton. Since the mid-1990s her films have not commentary, but go together with an optical soundtracks. To balance her visual art work, Tacita Dean has also published several pieces of her own writing, which she refers to as ‘asides. Tacita Dean was born in Canterbury, in Kent. She is the sister of architect Ptolemy Dean. She was educated at Kent College, Canterbury. In 1988 she graduated at Falmouth School of Art, and in 1990–92, studied at the Slade School of Fine Art. In 1997, Dean moved to London and in the same year she began to exhibit splices of magnetic tape cut the length required to document the duration of the sound indicated, such as a raven’s cry. In 2001 she was given a solo show at Tate Britain. In 2000 Dean was awarded a one-year German Academic Exchange Service (DAAD) scholarship to Berlin, where she moved that year. She focused on the architecture and cultural history of Germany, including iconic structure as well as important figures in post-war German. In 2009, the Nicola Trussardi Foundation has presented ‘Still Life’, the first Tacita Dean major solo exhibition in Italy, on the Piano Nobile – first floor – of Palazzo Dugnani, a historical Milanese venue for exhibition. Dean has undertaken commissions for London’s defunct Millennium Dome, the Sadler’s Wells Theatre, and for Cork, Ireland, as part of that city’s European City of Culture celebrations. She has also completed residencies at the Sundance Institute, the Wexner Center for the Arts, Columbus, US, and the Deutscher Akademischer Austauschdienst, Berlin. At the Turbine Hall, at the Tate Modern, Bankside, London, SE1 9TG. Showing from 11th October 2011 until 11th March 2012.